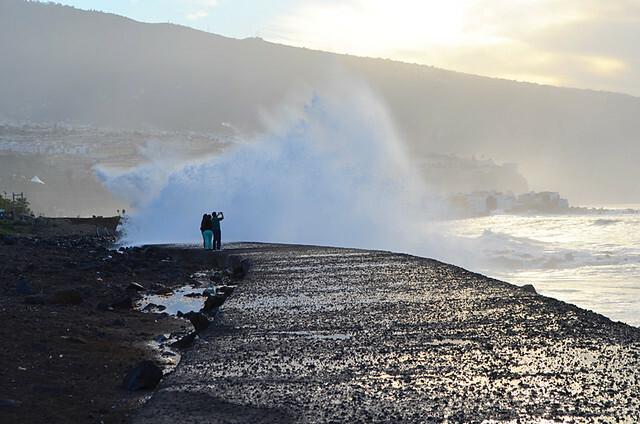 Videos of gigantic waves battering parts of Tenerife’s coastline are a reminder of how much the sea fascinates and even frightens us. It is a powerful and untamed beast. The Atlantic rollers which are a common feature in northern areas of Tenerife are hypnotic even when they’re just going about their normal, daily business. When they get into a lather during change of season weather, the show becomes spectacular. People love to gaze at the sea, it’s a magnet for the eyes. I’ve lost count of the number of times someone has commented, whilst gazing across a not-very-picturesque urban sprawl, “what a lovely view.” Invariably they mean they can see the sea. Staring out to sea is something we never grow tired of. Maybe it’s because of some primeval human desire to explore; an instinct which draws our eyes to the horizon, our subconsciousness wondering what lies beyond. Maybe that’s a load of tosh and nonsense. Whatever. 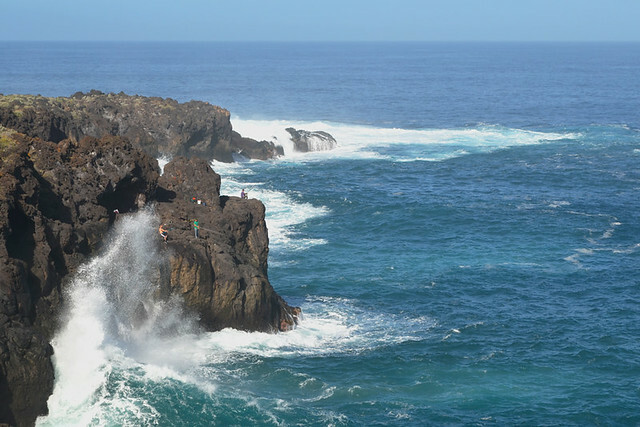 Here are some sea-themed scenes from around Tenerife to gawp at. Those frivolous waves can be like Sirens, calling us closer and closer with their irresistible songs. It used to be difficult enough to keep your distance on the sea wall at Puerto de la Cruz, but now the opportunity for that unique selfie can prove too much. Folk never learn. Incidentally, I was using a longer range lens so I could keep at a safer distance. The Atlantic rollers are incredible forces of nature to observe, and don’t really need any accessories to make them interesting to look at. But it always adds a watchable element when there are people trying to tame them. This was at Playa Socorro in Los Realejos. To me this scene typifies what people in northern climes dream about… and why Tenerife is such a popular winter destination. Early morning in January and it’s warm enough to stroll along the water’s edge in your swimming cossie. Actually I thought it was a bit on the cool side for that sort of business, but I’m acclimatised to warm climates to the point of being nesh (a great northern word you’ll have to Google if you don’t know it). 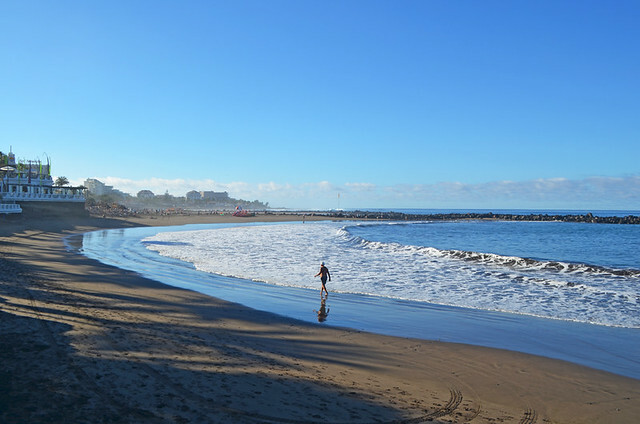 The beach is in Costa Adeje near the invisible border with Playa de las Americas. 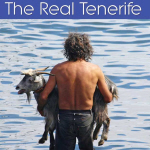 Seeing locals perched on rocks casting their lines into the Atlantic is a common sight on Tenerife. As a companion piece to the previous resort shot, this was the north coast in late December. It was a beautiful day with barely a breeze, not even a gentle sea one, and yet the waves were lively enough to potentially pluck a fisherman or two from their precarious positions. 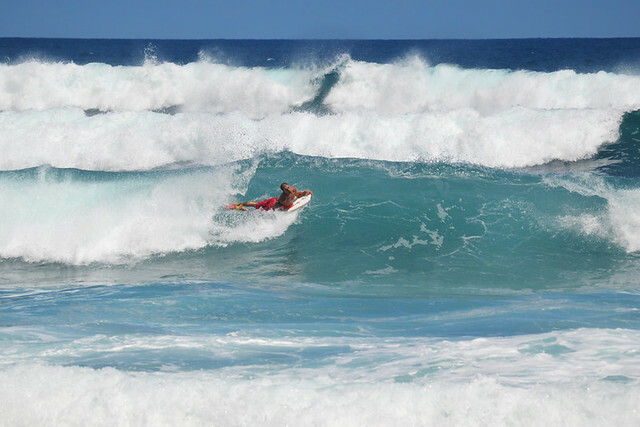 People often associate big waves with stormy weather but it’s not always the case, which is why too many people end up being ‘taken’ by surprise. Even on an island which is warm all year round this has ‘summer holiday scene’ written all over it. The girls on their way to the beach on a sizzling July day. The yacht in the background cruising inviting waters, its occupants clearly enjoying the sun; whilst on the horizon a ferry makes its way to La Gomera. 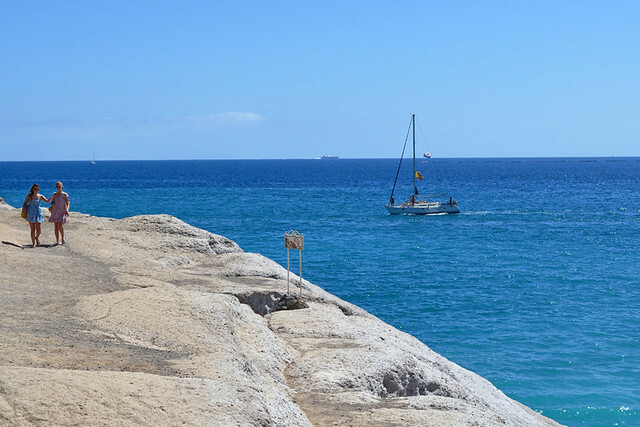 The rocks lead to our favourite southern resort beach, Playa del Duque. 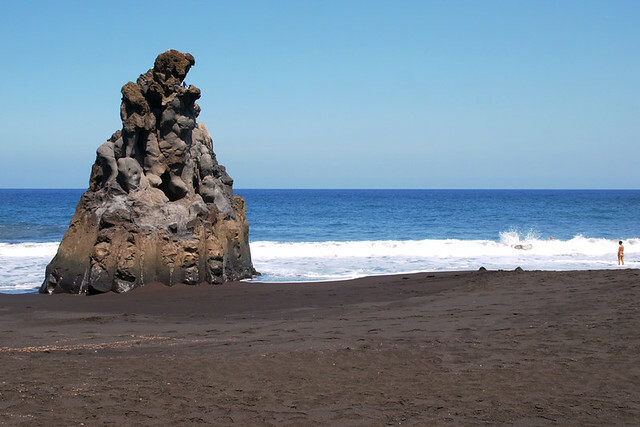 As a contrast, here’s the sea view from a volcanic, black sand beach in the north (La Orotava to be precise) in September. There’s more of a rawness to these northern beaches. You don’t find neat rows of sunbeds, the waves make the swimming suitable only for the strongest, and the rock looks as though it has melted on that spot. Being September, this was one of the calmer days at the shoreline. More the man-made lagoon at Playa de las Teresitas from above. 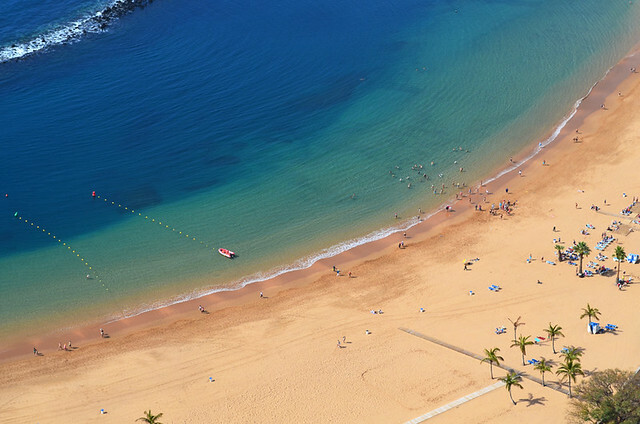 A little turquoise oasis of calm lapping a rare (for the western Canary Islands) golden sand beach. Who cares if the sand is imported, it’s a gorgeous view from the cliffs above the beach. And the sea looks even more inviting from on high than it does from the shoreline. 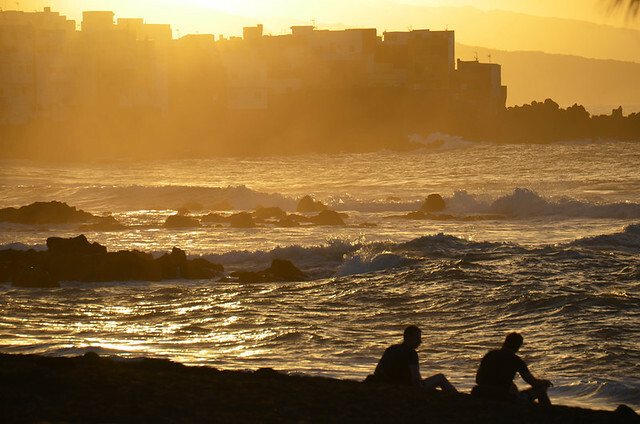 When sea views become even more magical at sunset, there are various places around the Canary Islands where people casually gather to soak up the scene. 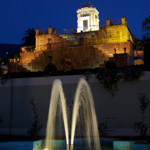 Playa Jardín at Puerto de la Cruz is one of those spots. 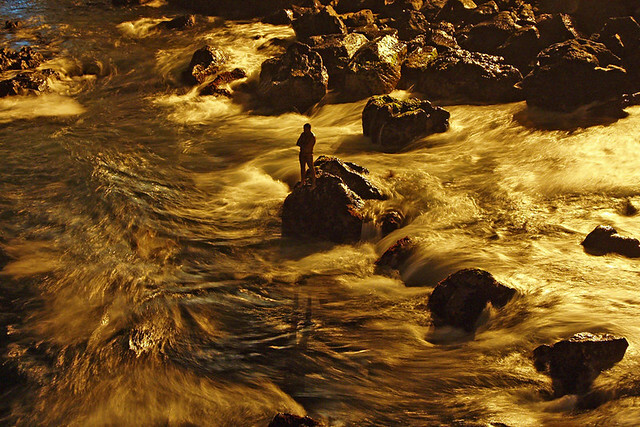 It’s long been documented that the port is touched by Midas at sundown, when parts of the town are bathed in a warm gold glow. This was taken on a February evening looking toward Punta Brava. Getting Mount Teide in the frame adds a unique touch to Tenerife sea views. 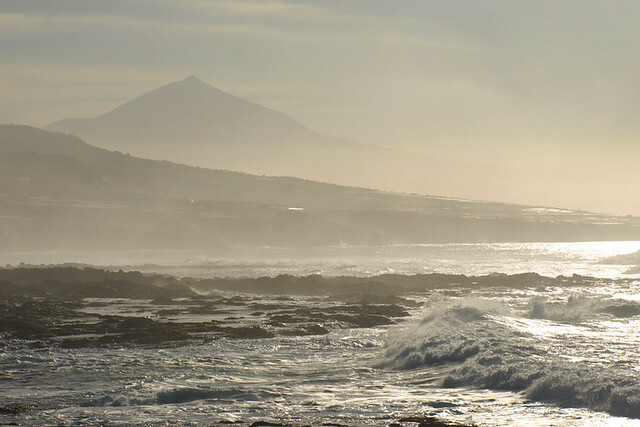 This isn’t the most vibrantly coloured image of the sea and El Teide I’ve got, but I like the cool, hazy silver qualities which give it a dream-like quality. The views from this part of the coast at Punta de Hidalgo can be pretty special. I took this photo years ago, during the July Sardinada at San Telmo in Puerto de la Cruz. 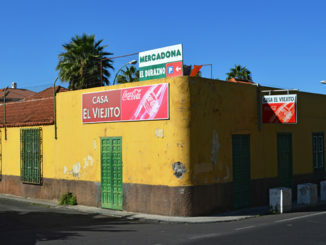 There was a fiesta with a lively Latino band playing on the San Telmo sundeck area just out of shot. Although it was a balmy evening, the sea was choppy. But it wasn’t wild enough to deter this lone swimmer who seemed completely captivated by the swirling waters around him. He stood like this, as though in a trance, for ages. For me the last is a scene which encapsulates perfectly the power the sea has to hypnotise us, to root us to the spot. Even when we’re standing on a rock whose surface space is getting smaller and smaller.